After a great night sleep I was hoping it was going to be a bit warmer today. Weather.com promised temperatures up in the 70s but we were well shy of that as the air was pretty crisp. Breakfast was at Rick’s. I have to say the food there was just awesome. Rick’s had two major wins in my book. The hash browns were extra crispy and they had grits. Nobody in California has grits. Mmmm, so good. I thought I was back in Georgia for that breakfast. If you’re in the area, I highly recommend Rick’s, even if you don’t get the grits. Tony was waiting on getting some parts installed on his bike so there was some time to kill before we got back on the road. The place I was staying had a nice pool so it was cool to get some laps in. I find that swimming on the road helps to keep me limber after a long day in the saddle. If I don’t stretch in some capacity some soreness starts to hit me in the third or fourth day. 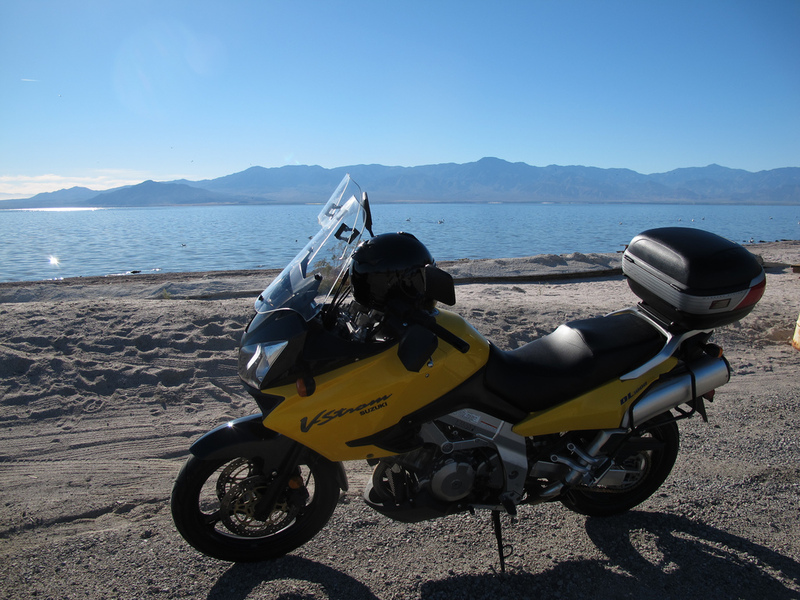 Tony’s bike was ready about noon, so to the Salton Sea we went. My first foray into desert climates in Death Valley was really uneventful. Everything looked brown and dead. After a few days there my eyes became acclimated to the small differences that surfaced in the park mainly due to altitude. Palm Springs is in the low desert. It’s very hot in the summer and in warmer in the winter. Joshua Tree, just a few miles to the north, is high desert. Joshua Tree is significantly cooler due to the altitude and thus has much more plant life than the low desert. The low desert was littered with chaparral and Sagebrush. All the other life around was courtesy of the Hoover Dam. Palm springs in particular very much looks like a green towel on a beach. The only lush life was in town. Once out of town things thinned out instantaneously. There were a surprising amount of migratory birds in the area. What the birds didn’t know is that the water they were in was not the oasis they thought it was. Each year their stopover was getting more and more toxic. We bid this spot goodbye and decided to keep rolling south. 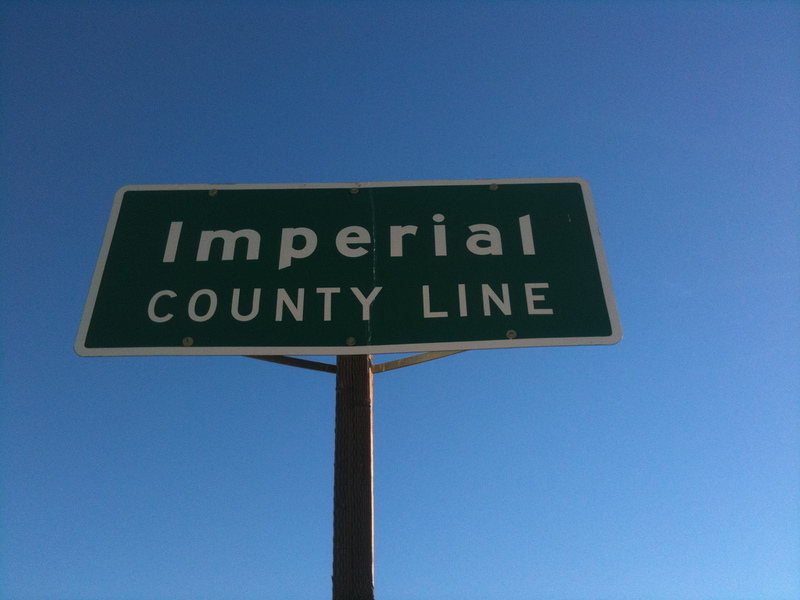 I was getting excited as we were getting very much in reach of the Imperial county line. 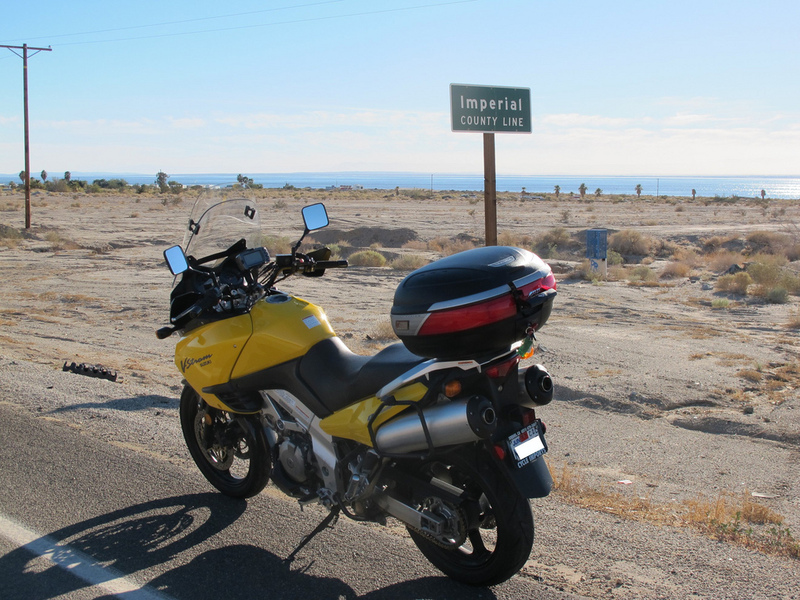 The Salton Sea is equally shared between Riverside and Imperial Counties. A few miles later we saw the sign and volia! Moving south the highway gently follows the shoreline with some curves, but mostly straight riding. The main town in the area is Brawley, CA. Brawley is an agricultural town about 25 miles from the Mexican border. We didn’t have the time or the passports to cross into Mexico so we got gas and then headed back north. CA-86 is a four lane expressway so we made good time on the way back north. We were a good bit further east than I’m used to so the sun went down much earlier. As we lost the sun the mountains had a very beautiful purple hue. That sunset was clearly the jewel of the day.